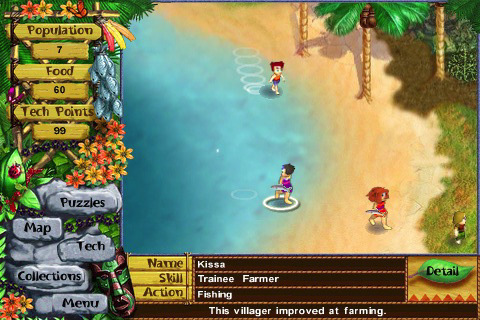 Unlike the first Virtual Villagers iPhone app, Virtual Villagers 2 is much more faithful to the original computer version (read: identical). This isn’t necessarily a bad thing, since anyone who has ever played the original can tell you that it’s a very robust little game, but if you have played it before, you may be disappointed by the lack of new content for the iPhone port. For those not in the know, the game runs in real-time, even when you’re not playing. You are an invisible god-like creature looking after a tribe of primitive castaways on a tropical island. It’s your responsibility to make sure they get to work, either farming, building new huts, making babies (don’t worry; it’s all very PG), or researching new technology. The villagers will usually keep on working once you’ve set them to a task, but you have to keep an eye on them, since they’re not very smart. Leave them alone for too long, and they might starve to death. The game is definitely a balancing act, except you’re managing people, instead of resources. The graphics aren’t anything ground-breaking, 8-bit sprites against a generic tropical backgrounds but they’re still plenty attractive, and your little people are charming in a blurred sort of way. I was very attached to my villagers, and I was always a little sad when I booted up the game to find a little bleached skeleton. One nice touch: the other villagers will collect up bones and give them a proper burial in the cemetery. My one complaint is that everything is very small. There is no zoom mechanism, which can make it difficult to grab a particular villager, but the touch screen make it easy to get around the island, and I didn’t have any issues with the sensitivity. The music is soothing, and the in-game sounds are nicely subtle. The game requires a fair bit of patience, since tasks can take days to complete, most of it done without you, and it’s hard to resist the urge to micromanage. However, if you’re looking for a fun, casual game that you can stretch over a long period of time, Virtual Villagers 2 is an amazing value. AppSafari review of Virtual Villagers 2: The Lost Children was written by Tracy Yonemoto on April 1st, 2010 and categorized under Adventure, App Store, Fun, Games, Puzzler, Resource Management. Page viewed 3853 times, 1 so far today. Need help on using these apps? Please read the Help Page.